Happy 6th Birthday to our Mighty Joe! A huge thank you once again to all of my sweet readers who have been with us since the day I found our littlest guy in a coma when he was just 7 weeks old. It means the world to me that you regularly ask how he's doing. We chose to keep Joe home for kindergarten, just as we have with every other child in our family since 1997. But unlike his seven older siblings, we could see immediately that we were going to have huge hurdles to overcome. Despite using a preschool curriculum created for the struggling learner with neurodevelopmental issues, by October it was painfully obvious that something was dreadfully wrong. We knew this, but until we started "school", we hadn't been quite aware to this level. We began to joke that Joe was a little like "one-sided velcro": nothing sticks. "Joe, this is the letter A. Remember? A." Point to the A, trace the A, find the A, click the A on the computer program, see the A on the grocery sign, write the A with a crayon. "Joe, do you remember what letter this is?" "Joe, it's an A. Remember?" It's a lot like Groundhog Day around here. Every time I park the car, I have to go over our routine of NOT jumping out of the car seat, flinging open the door, and running into the parking lot. Every single time. The white masses are the largest of 6 holes, bilaterally. Joe scores low average to deficient in every single area except gross motor. His gross motor is crazy-excellent, which is consistent with frontal lobe damage. He tests on the extreme end of the ADHD scale. 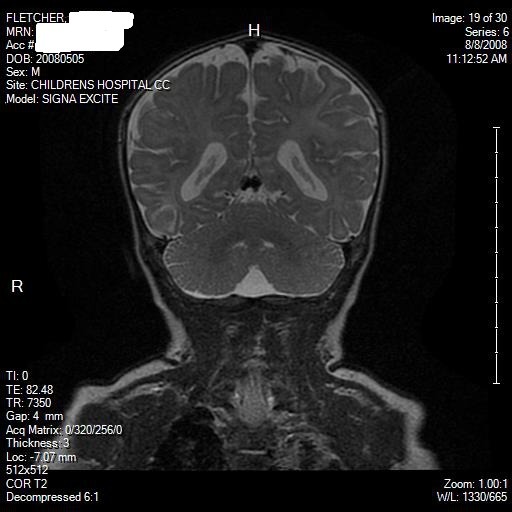 His symptoms are the result of the damaged areas (6 actual holes in his brain showing up in the MRI). Medicating Joe for focus issues has the potential to raise his IQ several points, as his assessments were severely affected by his inability to focus on one thing at a time. Medicating Joe for focus issues will be the difference between his ability to one day live independently or not. We're going this route for now. We might change course later. We trust his neurologist, who has tracked him from the day he was on the brink of a code until his appointment last week. Joe qualifies for full-time special education. Every day is Groundhog Day. Joe's brain will not heal. It will always have 6 holes, and they will not get worse or better. He has the markers for and the damage in areas that assure the onset of seizures (he's only had one since he was discharged from the PICU), and in that case, his brain will suffer more injury. Checking out his nifty hospital wristband at the neurologist's office. Joe is busy, to say the least. That's his "beary" taking a ride on the chair as they investigate the trash can in the neurologist's office. This may end up being my last public update of Joe's progress, because as he's getting older, he'll likely become increasingly aware of the differences between him and most people, and we want to turn his struggles into glory. He's sweet as sugar, funny, and cute as can be. He's adored by 7 older siblings and a host of fans. Our goal is to help Joe live the best life he can, because the Enterovirus was not an accident: God has already turned something horrible into something beautiful! There's a book written about Joe and the other trials we faced shortly after this one. It's made an exciting journey through publishing house, agent, and back again, and we're praying about how to get it into your hands. Pray with us? Thanks. Mighty Joe and I did a video on shoe tying. You can see it here.